Kuilfontein has been in the Southey family for five generations, since 1875, and has borne witness to a rich history, from wars, to drought, and floods. The original homestead was built in 1818 and has been an ostrich, sheep, racehorse and stud farm, and today is a mixed farming operation that produces South Africa's world-famous Karoo lamb. There are still herds of the original springbuck roaming the plains. A Karoo oasis built conveniently close to the N1, Kuilfontein Stable Cottages is a unique experience. 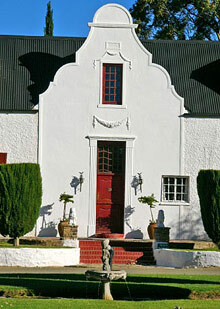 B&B or DB&B accommodation, in the delightful old stable quarters, which have been converted into luxurious guest rooms. "Thank you for a wonderful evening in your lovely guesthouse - I'll most certainly be back."